Instinctive, curious, bold and bouncy; Sarah is a mighty proud square peg, which wouldn’t be such a problem if the hole wasn’t so damn round. Sarah grew up feeling different. Her childhood Dr thought it was sugar. Her current Dr thinks its ADHD (Attention Deficit Hyperactive Disorder). Sarah still feels different, so what will a label do? Declaration examines when we want, need or are forced to declare our differences and the faces we wear to fit in. With autobiographical comedy, storytelling and conversations with audiences, this is a vibrant and daring adventure. There will be a free Wellbeing Room available for ticket holders to to visit after the show. 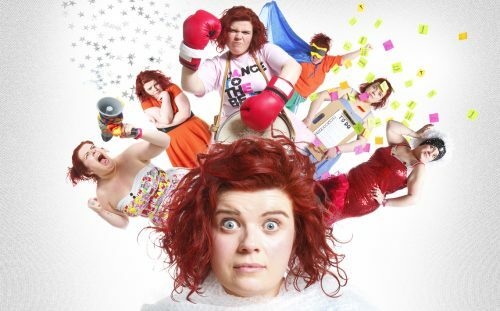 This is a curated safe space for audience members to explore feelings triggered by Declaration, particularly those with mental ill health and ADHD. Hosted by a Mental Health Support Worker, offering wellbeing activities and signposting, it is a vital component to help safeguard vulnerable audience members.